The library has several double sided printers, including a color printer. There is a per-page fee for most printing (there is no charge for printing at a stand-up catalog-only kiosk). Reference Rooms: Printers are to the North in the Reference area near the computers. Reading Room: Printers are in the adjacent room L-153 (walk toward the windows and turn right). Lower Level: There is a printer in the government documents area on LL1. In setup you will find it listed as "Library LL1 Printer". In the Web queue it is called Govdocs. Go to the Apple Menu > System Preferences > Print & Fax. Click the "+" button to add a new printer. For more details see the CUS setup page. Click "The printer that I want isn't listed"
Choose "Select a shared printer by name"
Be sure to select "Duplex Unit"
See the CUS setup page for more details. How can I print double-sided from my laptop? Why isn't printing working from my laptop? Did you release your print jobs at printing.reed.edu/release? How can I $ave paper by printing multiple pages per side? For other files: File > Print > Properties button > Finishing tab. 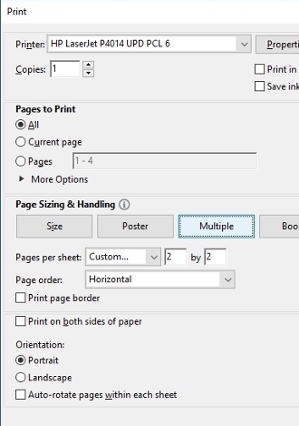 Use the "Pages per sheet" option. How can I print single-sided from the Library iMacs? 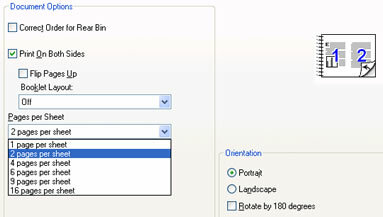 From the application you want to print from, click the File menu-> click Print. Click the big arrow to show more options Uncheck "Two-Sided". How can I print single-sided from the Library PCs? From the application you want to print from, click the File menu-> click Print-> click Properties-> click the Layout or Finishing tab-> uncheck the settings for "Print onBoth Sides". Select the Properties button, go to the Finishing tab, and check "Flip Pages Up". What if I'm having PDF printing problems? Save the file to the desktop. Right click the file, and choose to open with a different application. Do a test print of a couple of pages before trying to print the whole document again. Consult the Reference Librarian on duty.